Nail fungus, or onychomycosis, can occur on both the toenails and fingernails with the majority of cases typically affecting the toenails. A fungal nail infection is characterized by the nail becoming thickened and appearing discolored. As the condition progresses, the nail becomes brittle and the skin may become inflamed and painful if left untreated. This condition can impair walking and wearing shoes. Spa showers, swimming pools, and locker rooms where people walk barefoot are some of the places a person can get a nail fungal infection. It is important to always use protective foot covering when present in these areas. For a mild fungal infection, daily cleaning and over-the-counter products may be helpful. In more severe cases, oral anti-fungal medications and laser treatments may need to be prescribed. Removal of the infected nail may be necessary in severe cases. 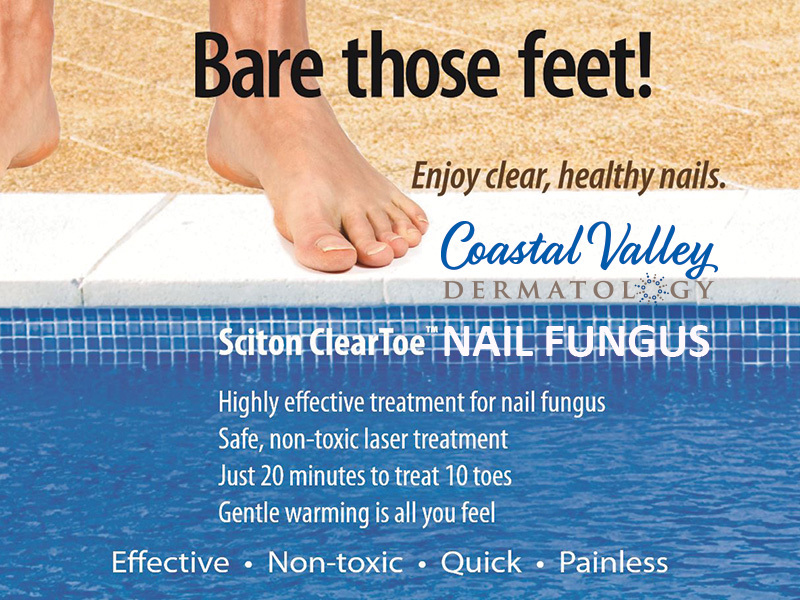 Safe, painless, quick, effective laser treatments for toenail fungus and fingernail fungus with Sciton ClearToe available at Coastal Valley Dermatology. Starting at $100 per treatment, 1-4 treatments may be needed depending on severity of your fungal situation. Use your health savings account (HSA) or flexible spending account for toenail fungal laser treatment(s). Get them nails ready for summer sandals and open toe shoes. How does nail fungus laser treatment work? Sciton’s laser technology heats the nail and the nail bed with laser energy resulting in a decrease of nail fungus and an increase in the growth of clear nails. The treatment involves passing the laser beam over the infected nails and surrounding skin. Your physician will repeat this until enough energy has reached the nail bed. Your nail will feel warm during the treatment. After Dr. Javid determines you have nail fungus, the treatment may be performed and there's no down time. What can I expect with a laser treatment? During Treatment – The doctor will wipe each nail clean with an alcohol wipe to make sure there is no dirt or debris. Baseline photos will be taken to document nail growth. At the time of treatment you may feel a mild-to-moderate heat sensation. Most infections improve after one 15-20 minute treatment. Immediately following treatment, no visual change in the nail will be detected, as it takes time for the clear nail to grow out. Number of treatments will vary depending on the severity of the nail fungus. After the initial treatment, Dr. Javid will follow up 2-4 weeks before a second treatment may be recommended. You may resume normal activity immediately following treatment. After treatment, it is recommended to wear new shoes and socks that have been washed thoroughly in hot water to prevent re-infection and further spread of fungus. Can the fungus come back? There is a chance of re-infection as the fungus lives within the environment. Proper post-care techniques are recommended to help reduce recurrence. Consult Dr. Javid about effectiveness and outcomes, and to discuss your treatment schedule. What causes fungal infection in the nail? Onychomycosis or nail fungal infection is a non-life threatening infection of the nails caused predominantly by anthropophilicdermatophytes (TrichophytonRubrum, TrichophytonMentagrophytes, etc. ), and to a lesser extent by yeasts (e.g. Candida Species) and non-dermatophyte molds. 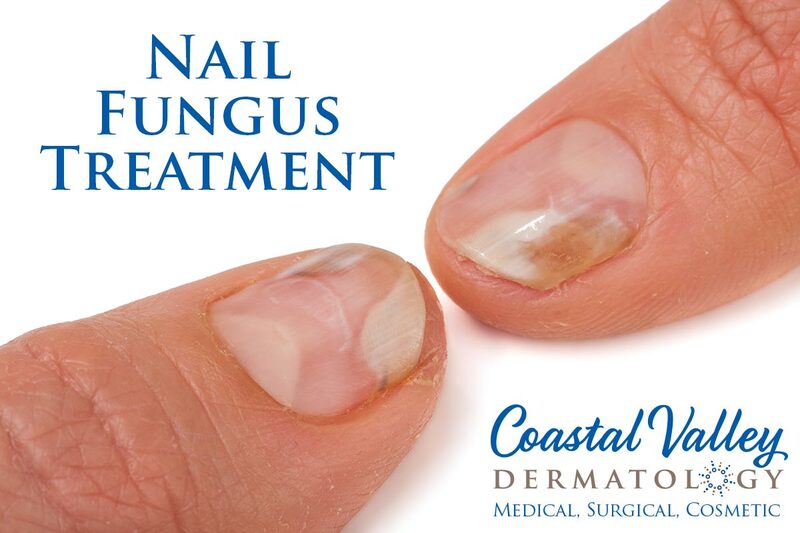 The nail fungus usually begins growing on the skin around the nail and then enters the nail bed and nail plate. Although visual changes are often observed in the nail, a proper diagnosis using a test designed to detect the presence of nail fungus is often performed to rule out other causes for the nail’s changed appearance. Where does the fungal infection in the nail come from? Fungi are present nearly everywhere, including in the air, the dust, and the soil. Shower floors, locker rooms, and swimming pools are suspected of being sources of the fungus, although there are no studies proving this fact. What are the symptoms of fungal infection in the nail? Infected nails often have one or more of the following undesirable changes in the nail: no luster, nail brittleness, yellow streaks, thick nails that may separate from the skin, or white spots. What Treatments are Available for Fungal Infection in the Nail? Nail fungus is prevalent worldwide and up until now, there have been very limited, ineffective, and undesirable treatment options. These options include topical or oral anti-fungal creams, or permanent removal of the nail. Topical (applied to the surface) – cannot penetrate the nail adequately to completely eradicate fungus and has to be applied daily. Oral (taken by the mouth) – not effective in all patients and side effects may include possible liver damage. Surgical removal or chemical dissolution of the nail plate – this often ineffective and traumatic procedure leaves the patient without a nail for months at risk of reinfection. Permanent removal of the nail – this is often considered a disfigured appearance. Laser treatment – short treatment times, minimal pain involved and no down time or side effects have been reported in any literature. The laser energy is delivered to the affected area (nail and surrounding skin). If all the fungal infection is killed by the laser energy, most patients experience some degree of a temporary increase in clear nail. Schedule an appointment with Monterey Dermatologist, Dr. Roya Javid, at 831-293-8458.